With just a few minutes of prep-work these ribs are fall-off-the-bone tender at the end of the day. The hubs and I are big thrift store and garage sale junkies. He might be a little more than I, but I definitely enjoy a good deal and the hunt for finding it! One of my favorite things to do is go to the cook book section and thumb through the books to find notes that the previous book’s owners left on the recipes. If I find a book that has a lot of notes I usually take it home. There’s something so fun to me about seeing how people altered or commented on old recipes before you could jump online and read a bajillion comments and alterations on any given recipe. I figure if I find a recipe that has comments written on it it’s probably worth making! Recently, the hubs brought home a stack of handwritten recipes cards he found in his hunting (he knows the way to my heart). 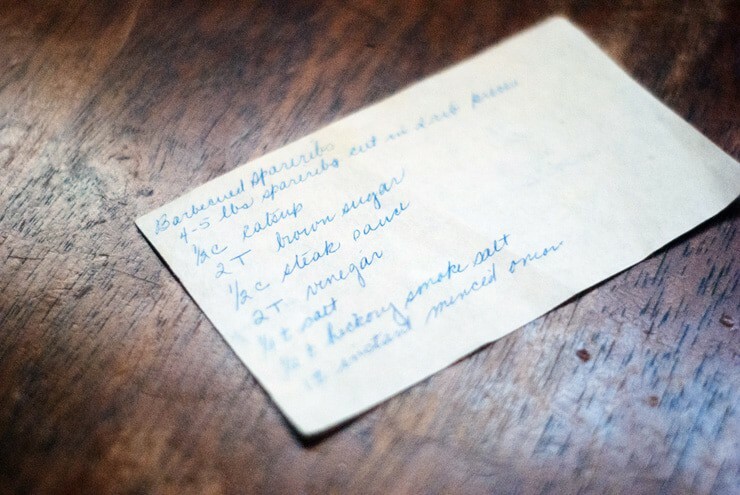 This recipe was included in the stack and was written on a simple piece of cut paper. I happened to have some ribs in the freezer at the time so I went to work and found out it was a definite keeper! They are SO good. To add a bit of flavor and cook off some of the fat, you cook the ribs briefly in a super hot oven. Once they are slightly browned you’ll transfer them to the slow cooker. 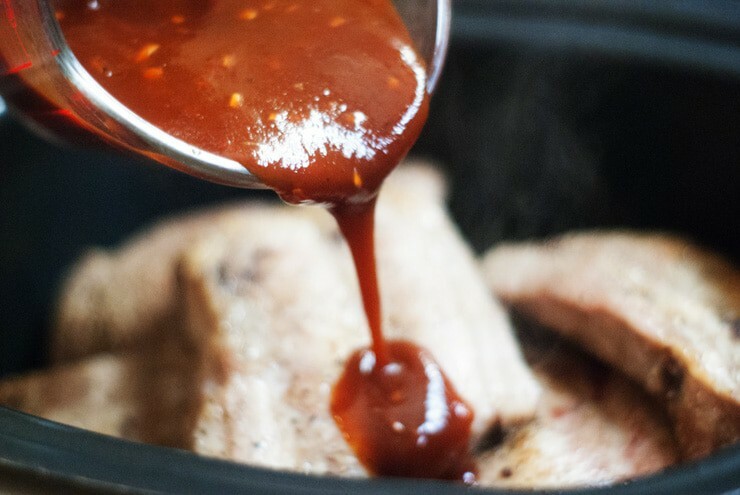 The sauce is a simple combination of ketchup, steak sauce, and a few other ingredients. 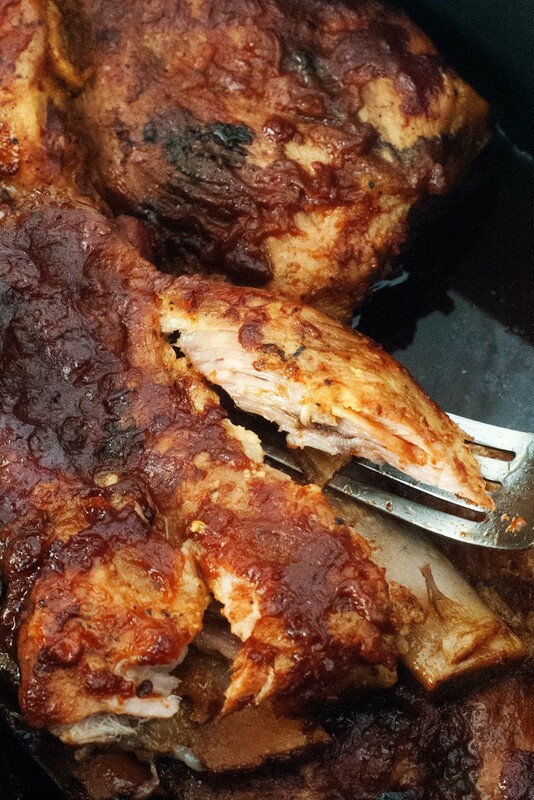 It’s not overly sweet or tangy but melts in perfectly with the rich ribs. You’ll just stir the sauce together and pour over the ribs. Cover the slow cooker and let it cook ALL DAY LONG on low. The recipe says it should take 6-8 hours, and mine took 8 before they were as tender as I wanted them. When they are done you’ll be able to pull the meat from the bone easily and they will be tender and just melt. You can add more BBQ sauce once they are done cooking, but I didn’t feel like they needed it at all. 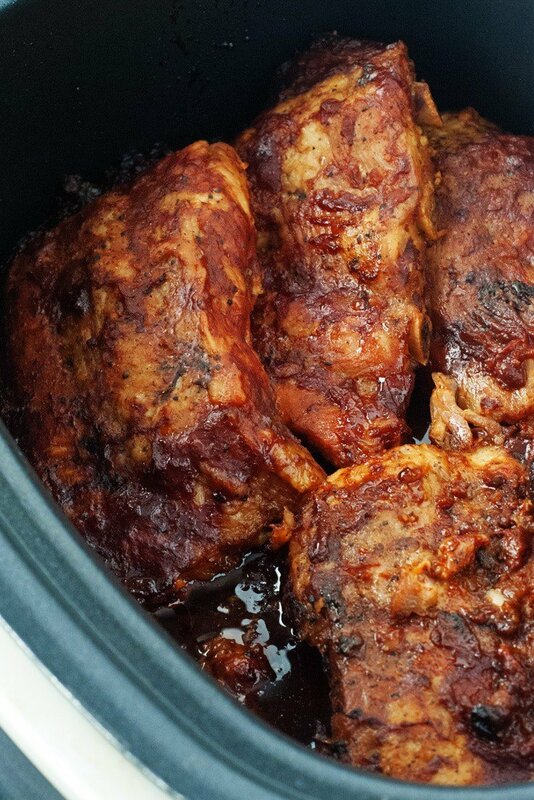 Cook them all day on low and open the slow cooker for fall-off-the-bone goodness! 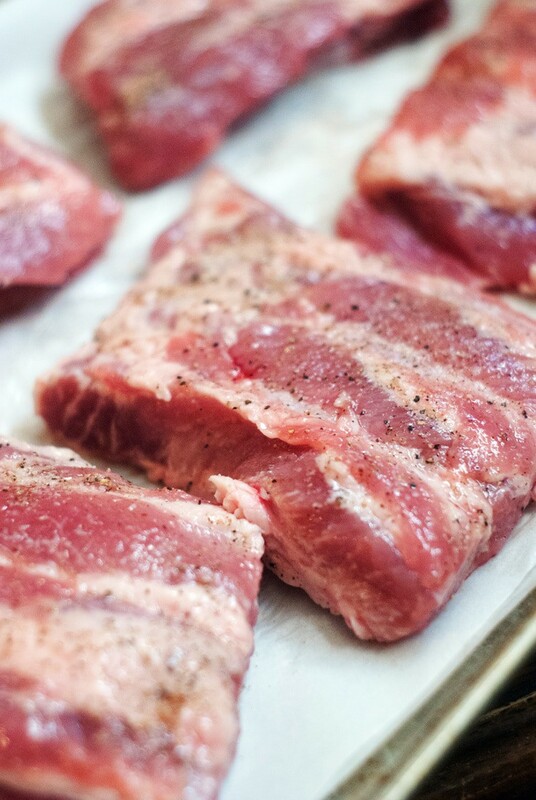 Cut ribs into 2-3 bone portions and lay on a lined baking sheet. Season with salt and pepper and bake for 10 minutes. Turn oven to broil and continue cooking the ribs for 5 minutes on each side until they are lightly browned. 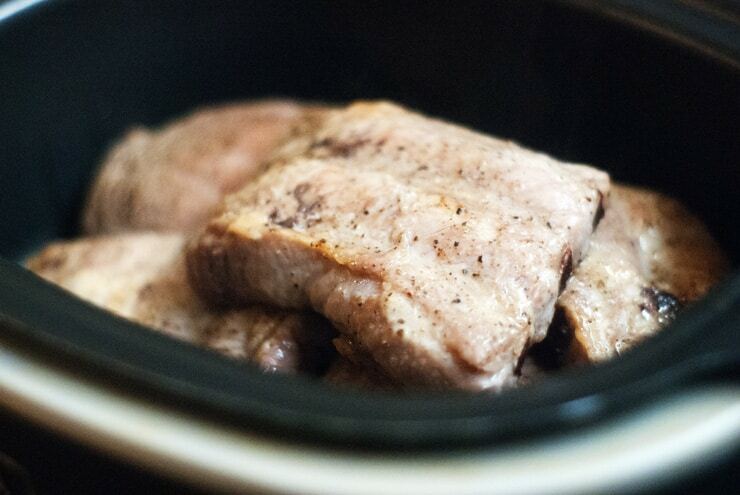 Transfer ribs to the slow cooker. 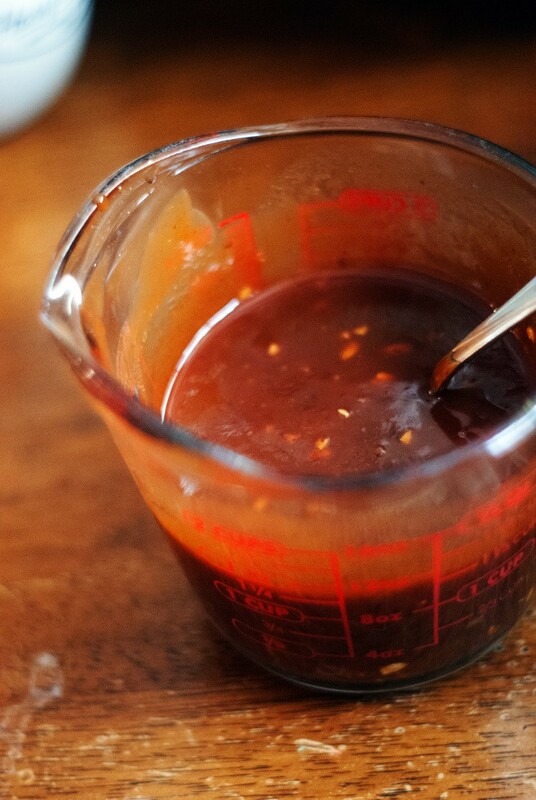 Combine ketchup, brown sugar, steak sauce, vinegar, salt, smoke flavor, and onion and stir until smooth. Pour over ribs. 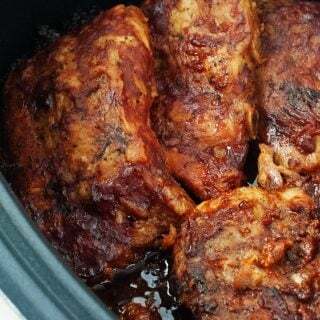 Cover slow cooker and cook on LOW for 6-8 hours or until the ribs are very tender and almost fall off the bone.